Hayes & Yeading’s unbeaten start to the season came to a halt at Capershotts on Saturday afternoon as having failed to breakdown a resolute Waltham Abbey defence, United were hit in controversial style fifteen minutes from time as Abbey striker Charlie Simpson appeared to clip last man Roddy Collins before lofting the ball over Jack Smith with the goal being awarded by referee Cresswell much to the dismay of players and supporters alike in United red. United set off like a train, attacking the home side straight from the kick-off and could have been ahead in the first minute as a fine passing move involving Lee Barney, Lewis Toomey and Toby Little saw the ball flying in the air from a blocked shot, Josh Chamberlain volleyed the ball back into the mix and Little’s shot was held by home stopper Arthur Janata. Seconds later Abbey striker Charlie Stimson, who was to prove to be the match winner for the home side, was cautioned for a dreadful tackle on Scott Donnelly which many thought should have been a red. The home side forced Jack Smith into action a few minutes later when a quick throw-in was laid off to Ronnie Winn who made space for a shot from the edge of the box that Smith did well to push around the post diving to his right side. The corner kick found an Abbey head but the effort was too high to trouble the United goal. Paul Hughes’ side continued the forward push and we were still inside the opening ten minutes. Little collected a Scott Donnelly pass on the left and made for the bye-line, his cross picking out Chamberlain who flicked a glancing header wide of the far post and this was quickly followed by a double block by the home defence inside their own area, firstly to deny Scott Bridges and then to deny Liam McDevitt with the rebound. 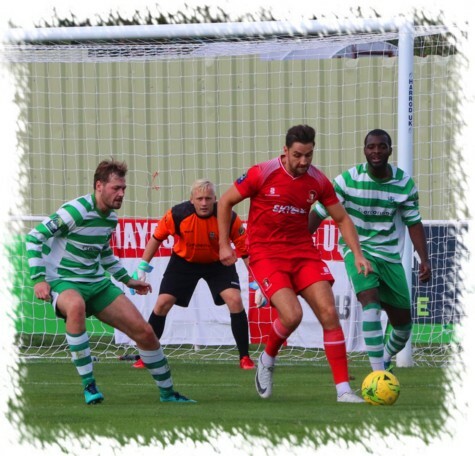 On fourteen minutes a free-kick for the hosts was rolled right by Joe Christou to Rob Clarke who fired past the United wall but the effort was also off target and Smith’s services were not required. Another sweeping forwards move by United saw Toomey win possession and then as passes flowed between Bridges and Barney, a little touch to Chamberlain set up a shot that Janata held low down to his left. Janata again denied United just before the half hour mark when Bridges sent Little away on the left, the United man’s shot from a tight angle that would have squeezed in at the near post being kept out by Janata’s outstretched boot. Two minutes later and with more than 15 to go in the opening period, the final chance of the half for the home side fell to Ellis Brown who beat Priestley Farquharson to a throughball however the United man did very well as a last ditch stretch saw him toe the ball away from the Abbey player who would have only had Smith to beat. Soon after, United’s rhythm was upset somewhat with the loss to injury of Toomey, his replacement being last season’s 21 goal striker Duncan Culley. Two further chances came United way before the break. McDevitt edged the ball into the path of Bridges who saw his 20 yard shot go just the wrong side of the upright and then in stoppage time, Culley won the ball and squared it to Chamberlain who in turn helped it on the Barney but his low drive was held by Janata and the half closed out with nothing to show on the scoreboard. Early action after the break saw Smith get down quickly to grab hold of a low driven cross from the Abbey left side and at the other end a volleyed Little cross sailed just wide of the far post. 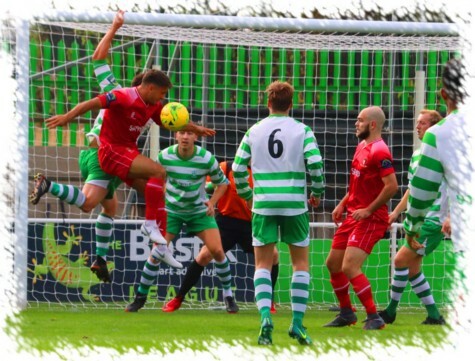 United then suffered another injury blow with Farquharson needing to be replaced, the new arrival being Ed Asafu-Adjaye who slotted into his usual position in the United defence. As we approached the hour mark, another Abbey free-kick by Brown sailed over the crossbar and then on the hour the home side owed much again to the solidity of their defence as United were again denied an opener. Barney chased a deep ball to the bye-line and cut it back to Culley who turned past his marker only for his shot to be deflected wide. The resultant corner was headed goalwards by McDevitt only for a well-positioned James Goode to clear the effort off the line with Janata beaten. 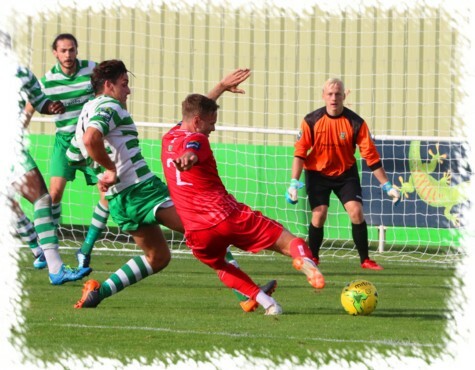 Another chance for United saw Barney collect from Tom Jelley, the ball ricocheted off a defender back to Barney who fired just wide from the edge of the box. The midway part of the half saw a mix up at the back for United as Smith came out to clear with Stimson charging down on him, only managed to pick out Ronnie Winn who with the goal gaping fired wide from 35 yards. On 75 minutes the game winner came amidst much controversy as United’s Roddy Collins and Stimson chased down a long upfield pass with the striker appearing to clip the heels of Collins which sent him tumbling to the ground while Stimson lofted the loose ball over the advancing Smith and into the net while howls of protest from United to both assistant and referee went unheard and the goal was given. The final fifteen minutes should have seen an onslaught on the home goal as United looked to pull the game back but sadly this was not to be for although United had much of the ball in this time, the home defence stood as solid as a rock with the best chance coming on 90 minutes when Culley won the ball in the air and found Bridges who set the ball into Jelley’s path but the wing-back’s drive was just too high to trouble Janata and United were defeated for the first time this season which sees Paul Hughes’ side drop to fifth in the early season standings. United Man of the Match: Scott Bridges.